Green Marine, a North American environmental certification programme for the marine, port and terminal industry, officially recognized the Port of New Orleans recently as a certified Green Port. The Port of New Orleans is the eighth US Port to reach certification in the voluntary environmental certification programme, which was created for the North American Maritime Industry. Green Marine certification is a rigorous, transparent and inclusive initiative that addresses nine key environmental issues. Participants are ship owners, ports, terminals, Seaway corporations and shipyards based in Canada and the United States. The programme encourages its participants to reduce their environmental footprint by taking concrete actions. To receive certification, participants must benchmark their annual environmental performance through Green Marine’s environmental programme’s exhaustive self-evaluation guides. They also must have their results reviewed by an accredited independent verifier and agree to publication of their individual results. In November last year, Port of New Orleans President and CEO Gary LaGrange received the 2015 McCullough Award at the National Industrial Transportation League’s 108th annual meeting, which was held in New Orleans for the first time since 1985. The award is presented annually by the League’s Board of Directors and Logistics Management magazine to the ‘Logistics Executive of the Year” and is named after John T. McCullough, a former chief editor of Distribution magazine, a predecessor to Logistics Management. Nominations for the McCullough Award are submitted by League members and voted upon by its Board of Directors. “Gary has an outstanding reputation in the transportation industry and we are extremely pleased to be able to single him out for this recognition and his many accomplishments,” said League Board Chairman Doug Kratzberg. “It’s certainly an honor to be recognized by this esteemed group, because they represent our shippers, customers and valued partners that contribute directly to our success,” LaGrange said. Founded in 1907, the National Industrial Transportation League is the nation’s oldest association representing shippers’ interests in both domestic and international commerce in all modes of transportation. League members include shippers and receivers of goods, carriers, brokers, third-party intermediaries, logistics companies and other service providers. As “The Shippers,” the League’s mission is to advance the views of shippers on freight transportation issues and enhance their professional development. The Port of New Orleans is a deep-draught multipurpose port at the centre of the world’s busiest port system — Louisiana’s Lower Mississippi River. Connected to major inland markets and Canada via 14,500 miles of waterways, six class-1 railroads and the interstate highway system, the port is the ideal gateway for steel, project cargo, containers, coffee, natural rubber, chemicals, forest products, manufactured goods and cruising. An extensive network of ocean carrier services, along with added-value services like transloading of bulk into containers, make the Port of New Orleans a superior logistics solution for many types of cargo. To stay ahead of market demand, the port has invested more than $100 million in capital improvement projects since 2012 and has a Master Plan to expand the Napoleon Avenue Container Terminal to an annual capacity of 1.6 million TEUs. The Port of Great Baton Rouge is located at the head of deepwater navigation on the Mississippi River, with a 45-foot shipping channel to the mouth of the river maintained by the US Army Corps of Engineers. Its exceptional maritime infrastructure and connectivity provide direct access to ship, barge, truck and rail. The port’s facilities are situated at the convergence of the Mississippi River and the Gulf Intracoastal Waterway. It is linked to other major ports between Florida and Texas and throughout 15,000 miles of the Mississippi River inland waterway system as well as to the Gulf of Mexico and ocean trade lanes to the world. The Port of Greater Baton Rouge offers a full range of maritime services and outstanding facilities, from a deepwater complex on the Mississippi River that can accommodate Panamax vessels to its Inland Rivers Marine Terminal on the Gulf Intracoastal Waterway. Property is currently available for development. product transformation processes including cleaning, drying, mixing and loading. Louisiana Sugar Cane Products, Inc. .
Brent Mahana has accepted the position of Metro Ports vice president – business development, with a special emphasis on growth in the US Gulf Region. Mahana joined the Metro Ports organization on 16 November last year, and will have nationwide responsibility for business development, acquisitions and development of strategic alliances with Metro’s stakeholders. Mahana’s strong background in the US Gulf Region will allow Metro Ports to continue its growth in the U.S. Gulf markets through the development of stevedoring, logistics and general cargo operations. Mahana brings more than 20 years of experience in various business development and logistics positions with several high- profile companies, including director of sales and marketing for Consolidated Terminals and Logistics Co. and Cooper/Consolidated; vice president of sales and marketing for Grillot Land & Marine, LLC; and general sales manager for The Ohio River Co. Also, he has served as chief mate and port captain for Dixie Offshore Transportation Co.
Mahana is a graduate of the Maine Maritime Academy, earning a Bachelor of Science degree in Nautical Science. Brent continued his education in marketing at the Harvard Business School and the Wharton Executive Education Program. 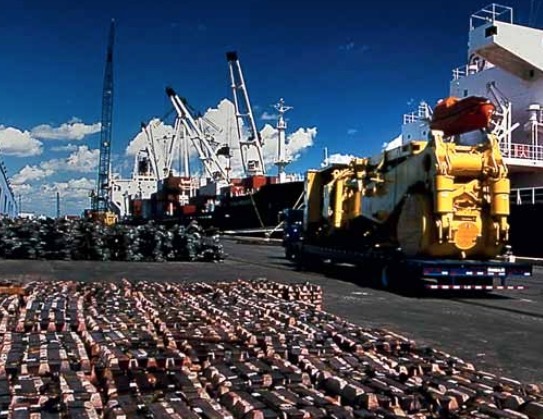 Metropolitan Stevedore Co. was established in 1923 in Southern California with business roots dating back to the 1850s Gold Rush era through its original San Francisco parent corporation, California Stevedore and Ballast Co. Through the years, Metropolitan Stevedore Co. became known as Metro so in 2008 the decision was made to use Metro Ports as the new brand for the various key operating companies of Wilmington, Calif.-based Nautilus International Holding Corp. Those key companies included Metropolitan Stevedore Co., Southeast Crescent Shipping Co., Suderman Contracting Stevedores, Inc., and Southeast Maritime Services LLC (which holds the Savannah International Terminal). Nautilus International Holding Corp, headquartered in Wilmington, Calif., maintains oversight of various subsidiary companies concentrating in stevedoring, terminal operations, agency, logistics and risk management. The companies of Nautilus International Holding Corp. excel in providing outstanding services to various market segments. These subsidiaries include Metro Ports, a contract stevedoring and marine terminal operator specializing in dry and wet bulk materials, breakbulk cargoes, forest products, wind energy, and a variety of other marine cargoes; Metro Cruise Services LLC and Metro Shore Services LLC, which jointly provide a full suite of services to the passenger cruise industry; and Metro Risk Management LLC, which specializes in claims administration and other risk management services. Corpus Christi sits on the mid US Gulf Coast of Texas and offers nine beaches, waterfront restaurants, hunting, fishing, and outdoor recreation to fill one’s heart. Nestled in this beach city is Port Corpus Christi, the fifth-largest US port in total tonnage and part of the largest industrial development region of the United States. In 2009, Port Corpus Christi received the federal funding needed to extend and widen the La Quinta Channel, opening up 1,100 acres of waterfront property on the US Gulf at its La Quinta Trade Gateway Project. Tianjin Pipe Corporation America (TPCO) chose Gregory,Texas — adjacent to the La Quinta property — to build a $1 billion seamless steel pipe facility, the largest single investment by a Chinese company in North America. In 2012, M&G Resins, an Italian-owned company, purchased land on the port’s Inner Harbor and is building the largest PET/PTA facility in the world on the Corpus Christi Ship Channel. In 2013, voestalpine, an Austrian company, announced a $740 million hot-briquetted iron facility on the La Quinta property and broke ground in April 2014, just after the La Quinta Channel Extension officially opened. Additionally, Cheniere Energy is constructing a $13 billion liquefied natural gas (LNG) export terminal on the La Quinta Channel with operations expected to begin in 2020. THE TEXAS GULF OF MEXICO IS BUSTLING WITH NEW INVESTMENT. SO WHAT’S IN STORE FOR PORT CORPUS CHRISTI? Port Corpus Christi is investing in infrastructure and working to bring federal funding for landside infrastructure improvements. In September 2015, the American Association of Port Authorities (AAPA) launched a campaign called Freight: Keep it Moving (#keepitmoving) to stress the importance of federal funding for road, rail, bridge and tunnel connectivity, vital for the nation’s seaports to handle the estimated freight volumes in 2025. AAPA estimates each port needs a minimum of $100 million in upgrades. Port Corpus Christi leadership has been innovative and pushed projects through that keep the port in competition. In 2007, Port Corpus Christi opened the Joe Fulton International Trade Corridor, consisting of 12 miles of new and existing roadway and seven miles of new rail line. The project provided 630 acres of real estate served by a –45’ channel and connected the port to Interstate Highway 37 and Highway 181. This year the port completed Phase I of the Nueces River Rail Yard, consisting of four parallel ladder tracks for a total yard capacity of 15,400 feet and 223 railcars. Phase II is currently under construction and will increase the rail yard to eight, 8,000-foot- long unit train sidings. The Nueces River Rail Yard utilizes $32 million in TIGER (Transportation Investment Generating Economic Recovery) grants and $23.8 million cost-share from Port Corpus Christi, Union Pacific, Kansas City Southern, Burlington Northern Santa Fe, and Genesse Wyoming railroads. These two projects were key factors in the decision for M&G Resins, which sits adjacent to both, to choose Port Corpus Christi. What’s next on the investment horizon? A Texas Department of Transportation Environmental Impact Study determined the 57-year old Harbor Bridge, which connects the Port’s Inner Harbor to the La Quinta Trade Gateway, requires major rehabilitation to improve safety standards. The City of Corpus Christi and Port Corpus Christi leadership have worked toward a replacement bridge plan, to provide a safe transportation route and ensure growth opportunities for the port and its customers. The newly planned suspension bridge will have a 205-foot vertical clearance, allowing for some of the world’s largest ships to call on Port Corpus Christi. Not only do the larger ships need a higher vertical clearance, but they also need a deeper draught and wider channel. The Corpus Christi Ship Channel Improvement Project includes widening the open bay crossing from 400’ to 530’ and adding 200’ barge shelves.The channel will be deepened from –45’ to –52’ and the channel entrance will be extended approximately 10,000 feet and deepened to –54’. The total project cost is $300 million. The project is approved and authorized and awaits Congressional appropriation for the 50% federal cost share. “The Channel Improvement Project is the most critical infrastructure investment of the next decade for the Coastal Bend. The days of federal earmarks are gone. Industry and community leaders, along with elected officials, will need to use their collective political muscle to secure the federal funding match for the port’s 50% cost share — hopefully this next year” says Judy Hawley, former Port Corpus Christi Commission Chair and devoted Texas transportation advocate. With 46 industries directly connected to Port Corpus Christi, it is imperative that the port runs a clean operation. The port is overseen by an Environmental Management System (EMS), which sets the standards for port operations and works with port customers to improve efficiencies. The US Environmental Protection Agency is seeking to lower the allowable ozone parts per billion from 75 to a possible 65PPB. Port Corpus Christi customers have taken voluntary measures to reduce ozone emissions and, as a result, Corpus Christi’s three-year average is 62PPB. The port’s Bulk Materials Terminal received the Industry Environmental Stewardship Award in December 2015 from the Coastal Bend Bays Foundation. The award recognizes leadership in conservation and protection of the Coastal Bend’s natural resources, and for placing high priority on environmental stewardship. The EMS continues to work to keep the port and the region in excellent standings. Port Corpus Christi will celebrate 90 years of people, progress and passion for economic prosperity in South Texas. Port Corpus Christi’s clean air, clean water, rail, highway, labour force and strong regional unity make it the ideal location for operations. People have been the catalyst for growth in the region, from port leadership to city and county officials, and port employees who move the port.